Thyroid specific G12/13 deficient mice. We have generated mice lacking alpha subunits of G12 and 13 G-proteins in thyroid ephitelial cells. 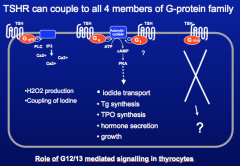 We are currently evaluating the role of G12/13 signalling in the thyroid development and adult thyroid physiology. 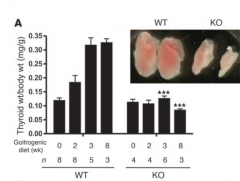 Thyroid specific DICER1 KO mice. MicroRNAs play important role in thyroid cancer and development.To understand the role of Dicer1 in thyroid in vivo, we have generated a constitutive, thyrocyte-specific Dicer1 knockout mouse line (cTgKO) by crossing Dicer1 fl/fl mice with Tg-Cre mice expressing the Cre recombinase under the thyroglobulin promoter. 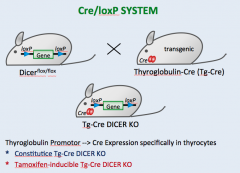 Additionally, we have created an inducible thyrocyte-specific Dicer1 KO model (iTgKO) by using a mouse line expressing a tamoxifen-inducible Cre under the thyroglobulin promoter to be able to study the role of Dicer1 in adult thyroid. We are currently evaluating these models.